In this post: Do your outdoor living spaces look the same year after year? 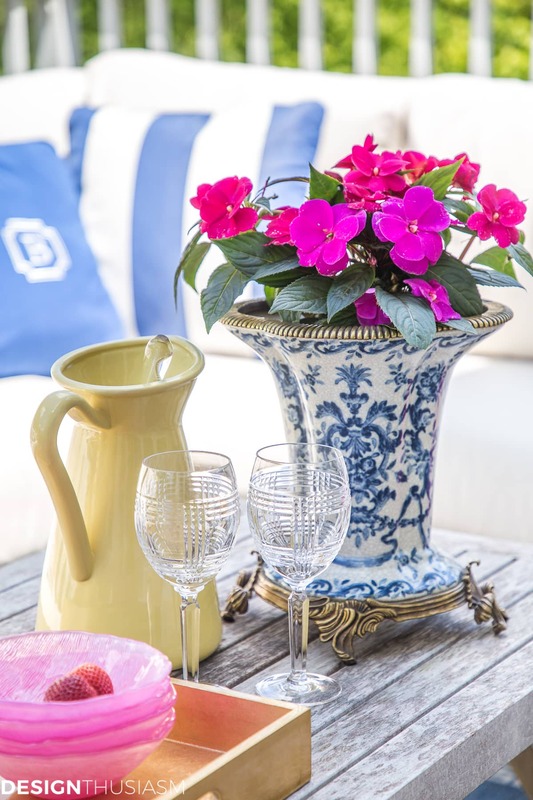 Here are tips and tricks to update your patio decor using inexpensive accessories in summer colors. Today I’m joining with 6 other bloggers as part of the ‘Summer Colors Blog Hop’, hosted by my friend Jennifer from Town and Country Living. We are talking about adding summer color to our homes and exploring how we each perceive summer color. Please be sure to scroll all the way to the bottom to enjoy Monday’s posts linked below, then be sure to come back all week to see the remaining tours. Is your patio decorated exactly the same every year? Several years ago in our old house, we bought an outdoor dining table with floral printed chair cushions. It was very pretty the first year. And kind of nice the next few years. But after a while, it got really boring. The same print. Every. Year. And it was too busy to style much else. So I began to hate it. If this is you or you’d like to avoid a similar experience, read on. 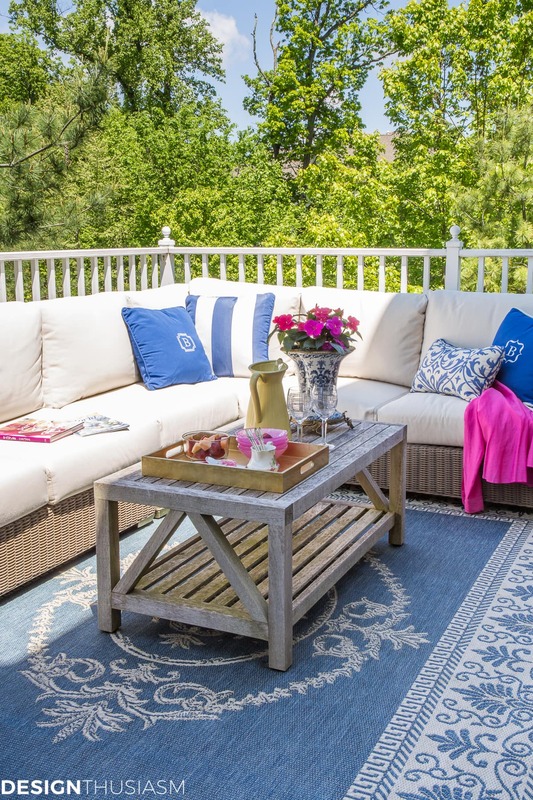 Today I’m talking about how to update your outdoor living spaces with accent colors, particularly what I perceive as the colors of summer. 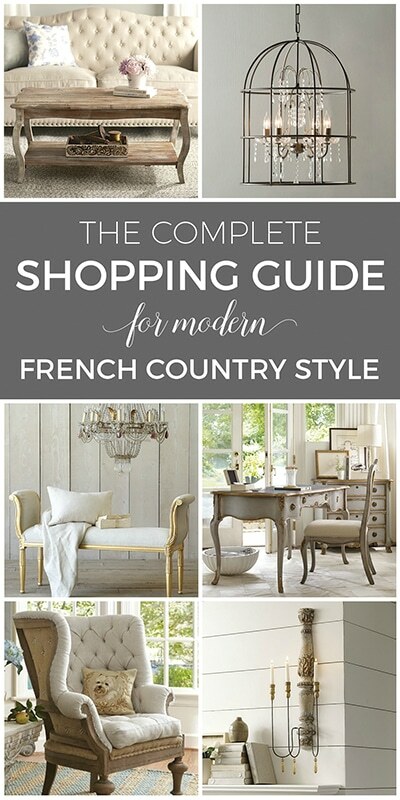 Now to start off, it certainly helps if your large furniture purchases were bought in neutral colors. Our sectional couch has a rattan frame and natural cushions. The tables are cream and teak wood, which allowed us to go in any direction color-wise. At first I was non-committal and for each event I chose a completely new palette, allowing the pillows to drive the color direction. Mostly I dragged outside a selection of indoor pillows and needed to put them away when the event was over. You can see the patio styled that way in sunbaked colors HERE, in lilac and yellow HERE, and in florals for fall HERE. 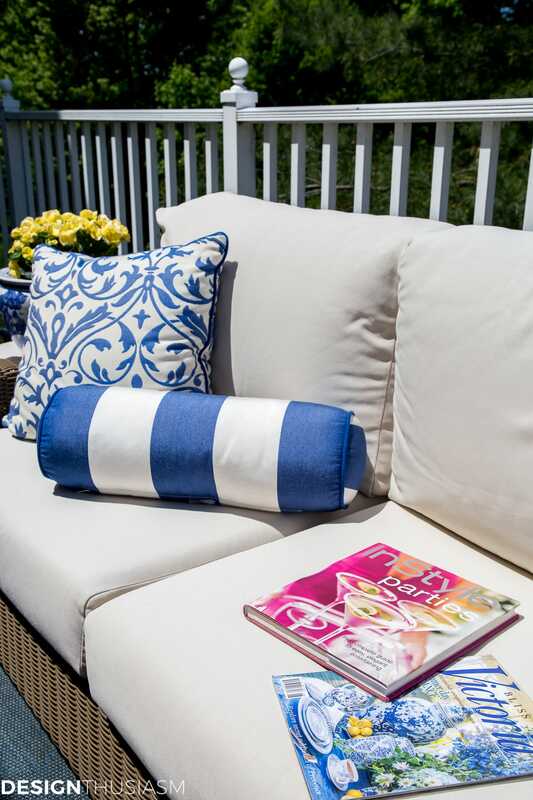 But ultimately I wanted outdoor pillows that could stay out all summer and I made the commitment to go with blue and white. I bought planters to match and eventually added a blue rug to really pull the space together. It looked fabulous and much like an outdoor living room and you can see the result in my OUTDOOR LOUNGE post. Still, as pretty as blue and white is, I began to worry that I would get bored with this pairing year after year. When it was just pillows they were easy enough to swap out, but now I had committed to a rug, too. The simple solution was to find accent colors that could work with my palette and I enjoy picking a color story each year to update the look. Last fall I updated with BURNT ORANGE accents, but this year I chose to use vivid summer brights in yellow and fuchsia. 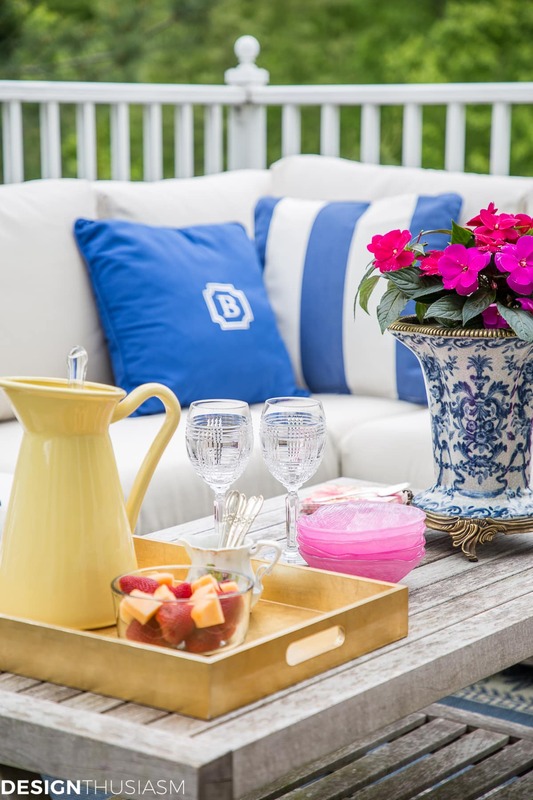 Here are 6 ways to add summer color to your outdoor living spaces. 1. Flowers – Ok, this one is the most obvious and, in my opinion, the most fun! It’s also where I start. If you choose a color palette and buy accessories, and then get to the nursery and nothing fits with it, you’re stuck. So I always pick my plants first and work everything else around it. I selected fuchsia impatiens and yellow begonias, knowing both would look lovely with my chinoiserie pots. 2. Books and magazines – A great way to add color both inside the house and out is with books and magazines. 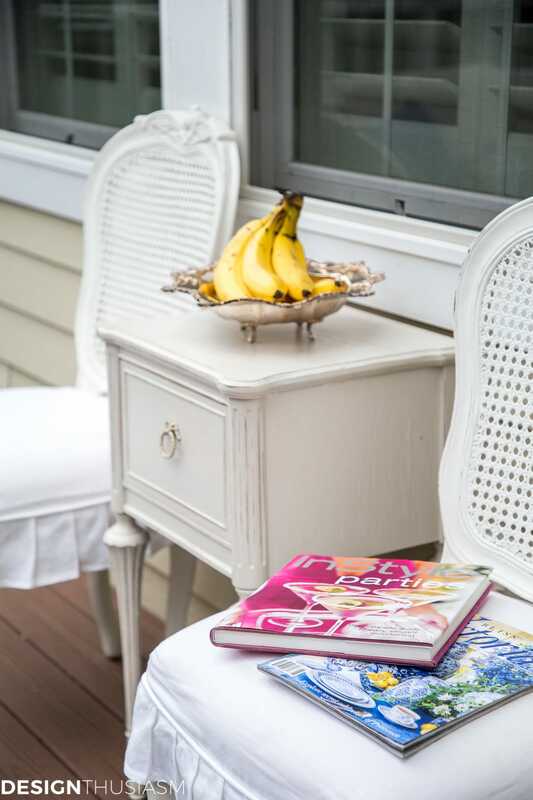 I love to sit outside and read, so this makes perfect sense, and when I’m entertaining I try to find selections that are not only interesting to thumb through, but co-ordinated with my palette. 3. Tabletop items – You’re going to be serving anyway, so why not utilize dishes and drink ware to further display your pop colors? 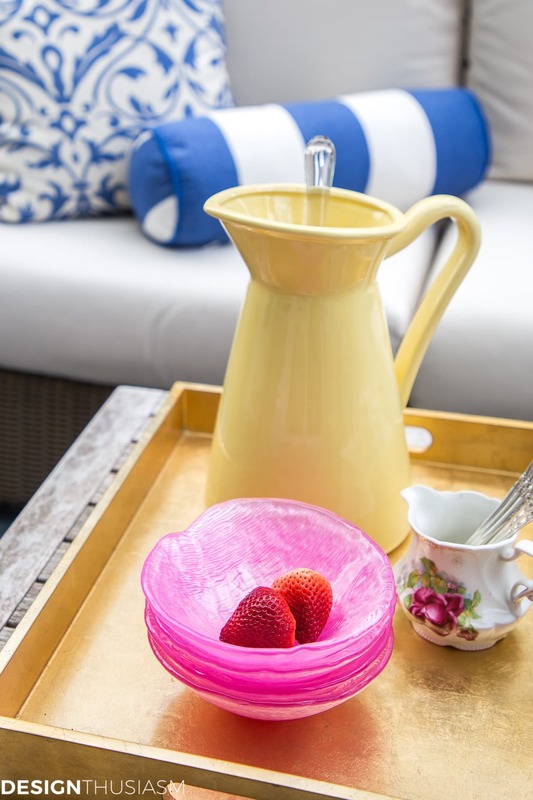 The yellow pitcher is perfect for serving sangria or punch and the pink glass bowls would work with ice cream or fruit. You can also use colorful stemware and patterned plates, plus napkins and serving platters. In fact, the options are limitless. 4. Throw blankets – I actually didn’t receive the throw I had ordered, so I used a shirt for the photo here, but it serves the same purpose as the throw that’s on its way. A dash of color tossed on the seating, throws are also useful for when the sun goes down. 5. 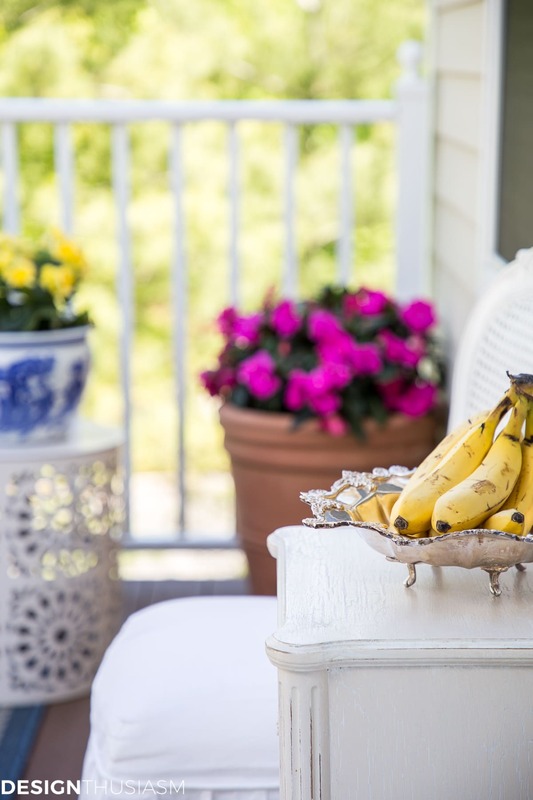 Fruit and other food items – Never underestimate the styling benefits that food can offer, whether it be a bowl full of lemons or bananas, or something else that goes with the colors that you chose for your own patio. I wouldn’t limit my actual menu this way, but to make a statement for when guests arrive, a well placed platter of color can go a long way. 6. 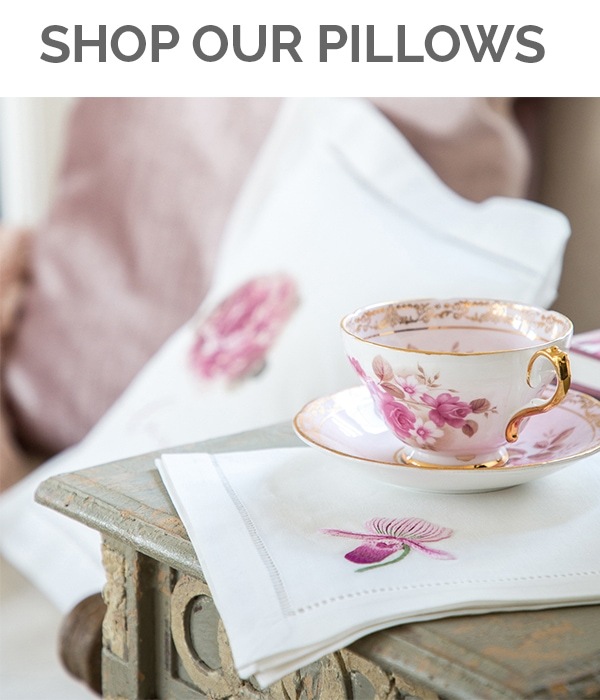 Pillows – Initially, I wasn’t going to include pillows on the list because I already owned mine, but this is a super easy way to add color. Even if, like me, you already have a group of pillows, there’s no reason not to add a new one or two to work with your expanded palette. What I haven’t yet mentioned, but also needs to be considered, is the color in your natural setting, from the exterior of your house to the trees and natural elements nearby. If you have a huge red bush, you’re not going to be able to ignore it, so better to work with it as part of your design. In our case it’s all green trees and natural siding, so it’s not a major issue that limits our styling. 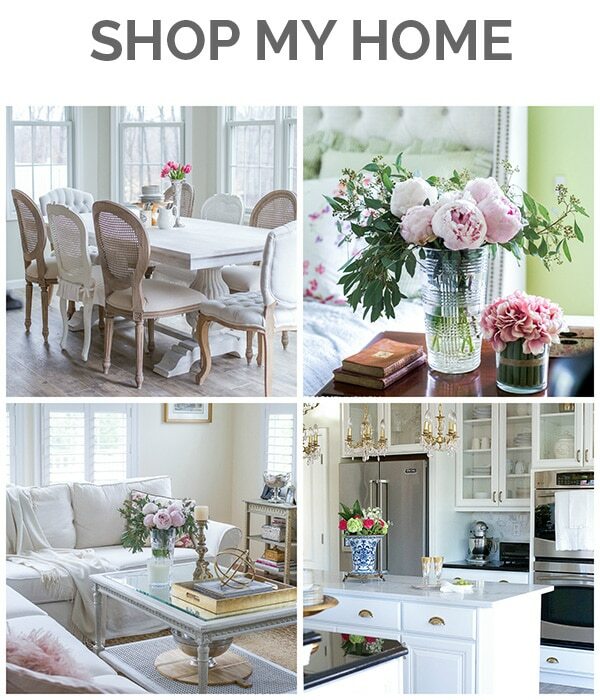 And what if you have floral cushions like I had with that early dining table? What I didn’t realize then is that you could simply work the same concept but do it in reverse. 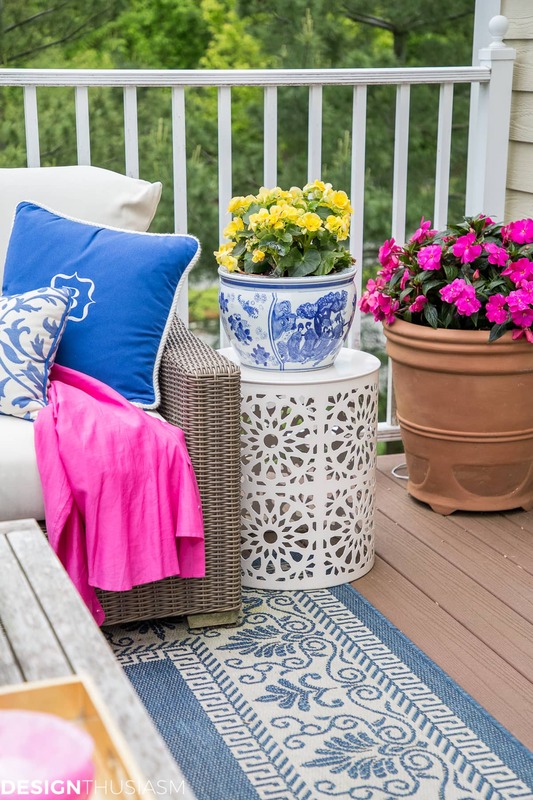 Rather than using several colors to add interest to a simple palette, instead pull out one individual color from the pattern for your accent, using a different one each year to highlight in your patio decor. 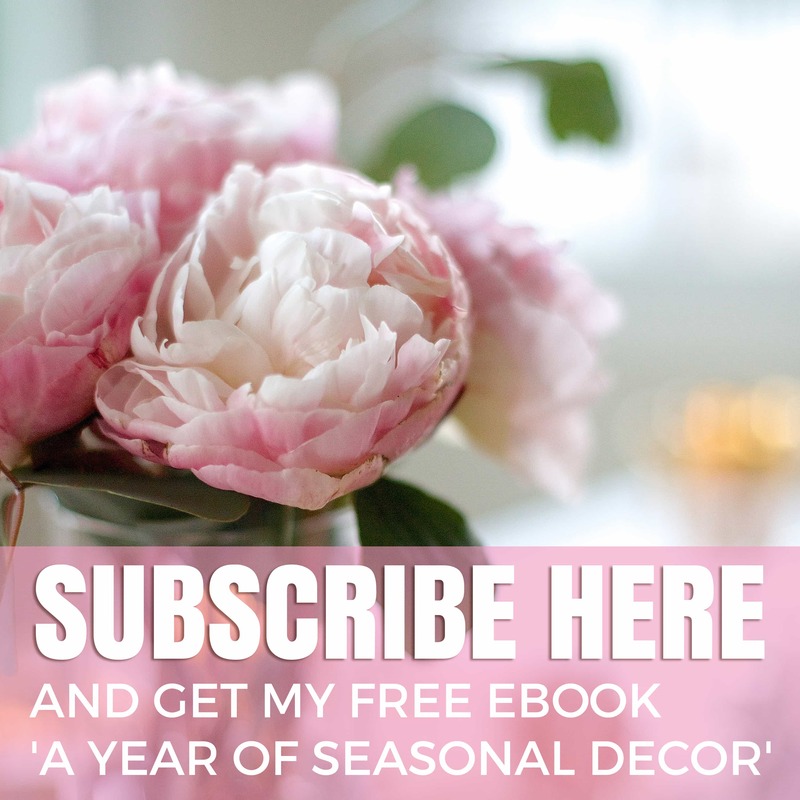 If you love summer as much as I do and enjoy spending time outside, these inexpensive tips and tricks will keep your outdoor living spaces looking fresh and new year after year! 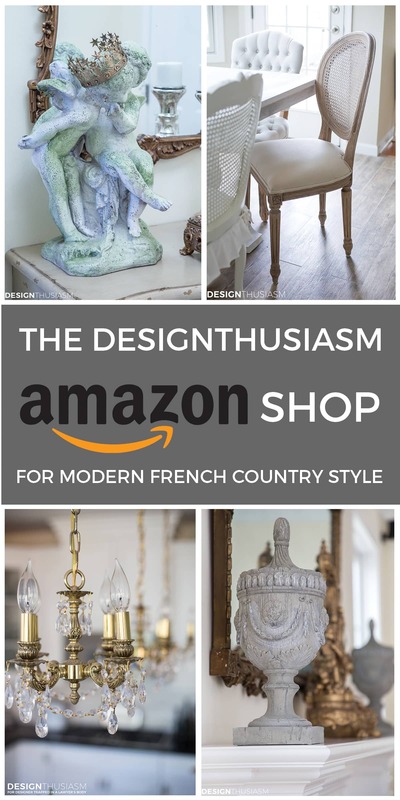 Outdoor Living Spaces Source List – To get the look, click on the items below for direct links to the products. Where actual items were no longer available, I’ve provided similar options. Please enjoy the posts linked below! Everything is so lush and green and it brings out the beautiful blues that I would never get tired of! Looks like a great place to relax in. Lory, I love the added pops of pink and yellow to the blue and white. What a pretty outdoor area to sit and enjoy those magazines or books and a cold drink. 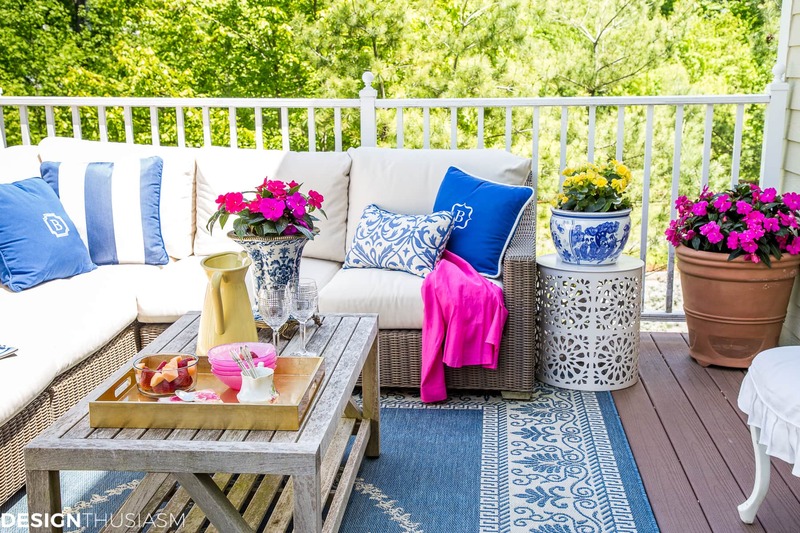 I have always loved seeing your beautiful, beautiful deck….must say that I so LOVE the rug! Love the way it grounds the area with that gorgeous shade of blue. Love the pops of the yellow and pink. Have a most wonderful day, hopefully enjoying the beauty of your deck! 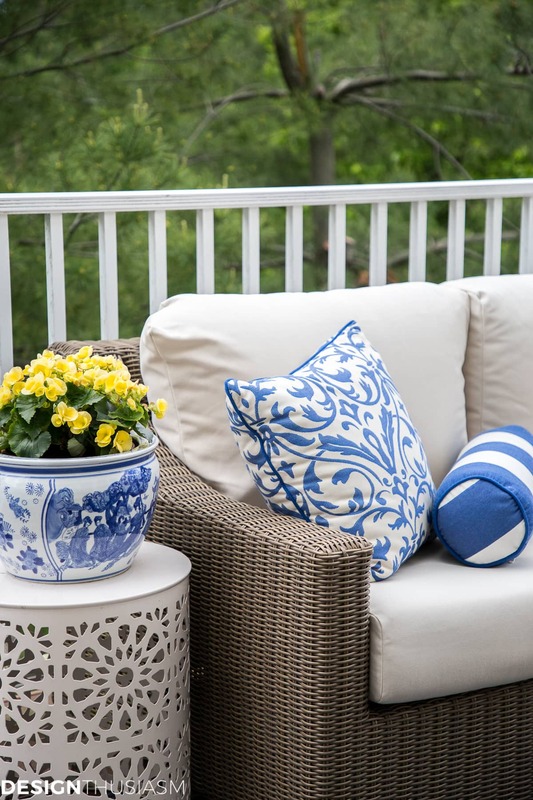 I love that you added pops of color to your blue and white base…perfect for summer. I hope you get to spend lots of time in this lovely space…without your computer! Haha, thanks Ann! I hope so too!! Blue and fuchsia is one of my favorite color combinations! Your deck looks so fresh and inviting and your flowers are beautiful! I haven’t even bought any for my deck yet. With all this crazy rain, I was afraid they would drown out there in my containers. Hopefully the sunshine will return and stick around for awhile. Enjoy your Memorial Day! The patio is so beautiful and comfortable-looking. I love the hot pink and yellow accents with the blue and white- they give a real tropical feeling. you have the perfect backdrop for such a gorgeous patio. 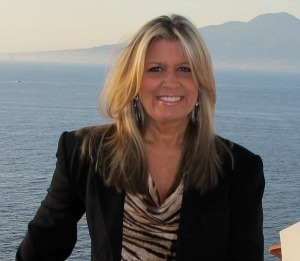 Love all your beautiful details and fun, bright colors! Your outdoor space is perfect for summer. Thanks so much for being on today’s tour! First, I love your patio! It looks great! Second, you said something about not having to bring pillows in the house. Do you leave your pillows and cushions outside even in the rain? I have no awning for my patio so everything would get wet if I didn’t bring them in the house. I wonder if they are outdoor fabric would it be safe to leave them outside? Thanks! Thanks for your kind words!! Yes, the blue pillows are all made from Sunbrella fabric which is the same thing the outdoor furniture cushions are made from. So I do leave them outside, unless we’re expecting a really heavy storm. Love your patio! The pops of blue and pink are such a fabulous combination of colors. You have just the perfect amount of color to accent your neutrals! I just want to come over and visit you! Hi Lory! I’m loving all the bright pops of color! 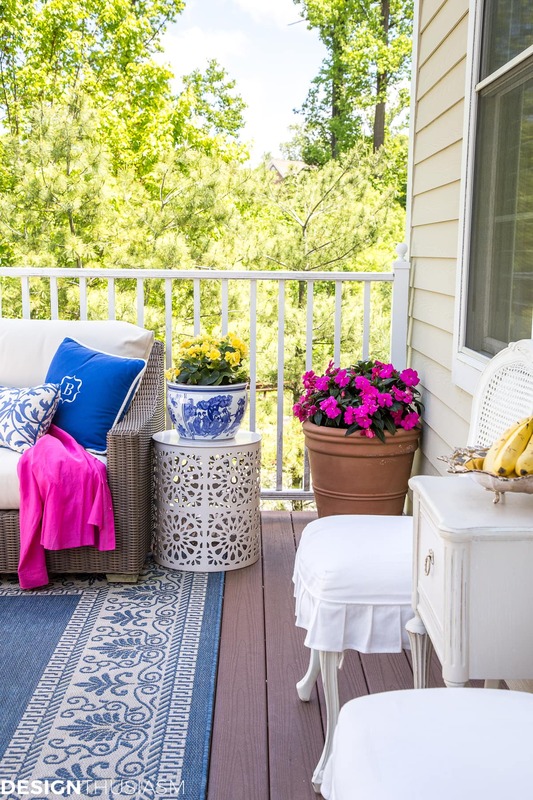 It make the deck so cheerful and inviting! That garden stool is amazing too!!!! 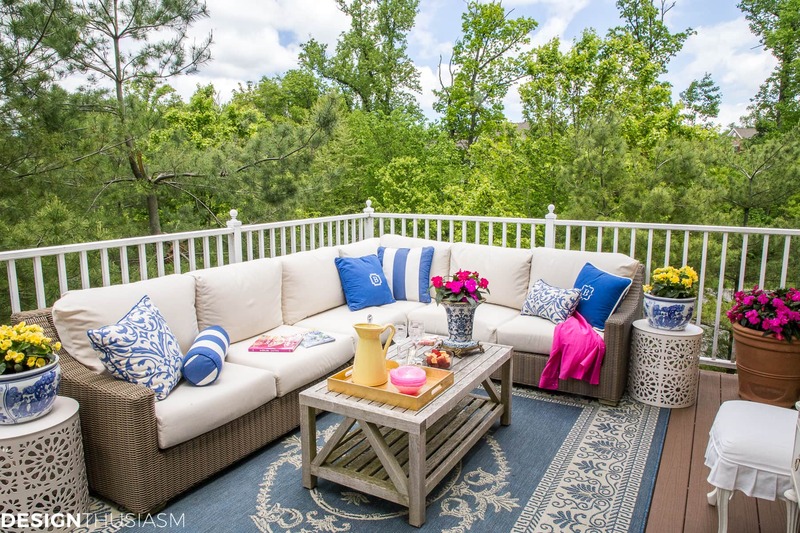 Lory, your deck is gorgeous and the blues and bright pinks are so fun for summer. I am inspired! Such pretty pops of color! Love your pop of color! The flowers are amazing! The porch is so excellent and open to looking. I adore the hot pink and yellow accents with the blue and white-they give a genuine tropical inclination. Thanks for sharing this amazing post.